The days are still long, the temperature is high, I hope you are enjoying a relaxing holiday somewhere ? Summer is colorful and travels are always inspiring. So how can we take this holiday feeling home? Would be great to keep our travel memories alive in your home the next weeks, or even months. When I think of summer I think of colors. South America has this "joie de vivre". A much more relaxed style of living than we know it. Is it the sun which slows them down? Probably. They use colors all around, for everything. Think of Mexico and your will immediately have a clear picture in front of you. 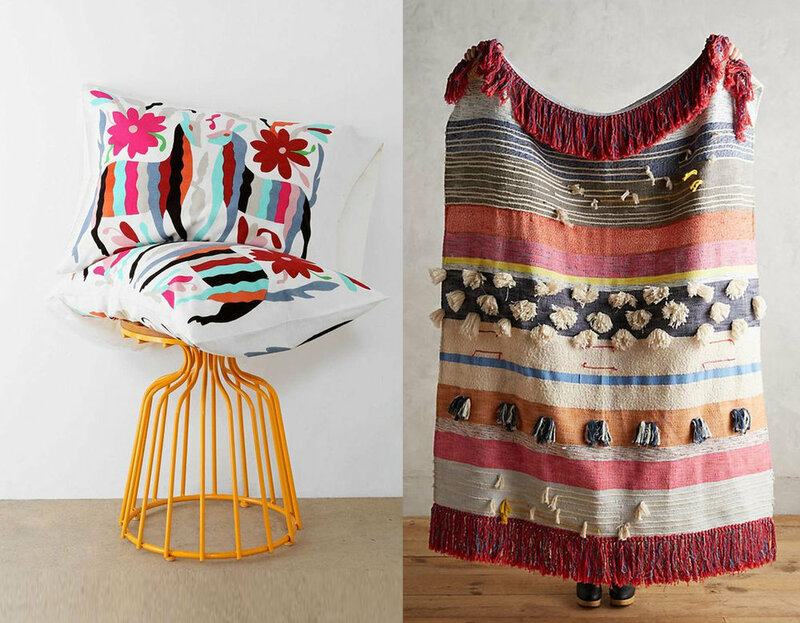 Let Frida Kahlo inspire you to mix colors, motifs. On holiday you are in a relaxed mood, you enjoy your surroundings, and you want to create the same mood at home. It can be dangerous to come home with to much souvenirs, you don't want to turn your home in a vacation home. But there are a lot of things which can be integrated in your home without any problem. Specially when you love bohemian style you can mix without any hesitation. Textiles are perfect as souvenirs, you can add them to give a summery look to your room. In winter you can put them away to take them out again in spring, to quickly forget about the cold winter months. Or you keep them around to remind you, during the dark and cold days, of summer which will come soon. Embroidered cushions will bring an exotic touch. Blankets will keep you warm when sitting outside on an early autumn evening or in front of the fire place in winter. Rugs are another thing you can bring home, when not to big in size. You know before people were putting the rugs on the floor, as we know it now, they were hanging it on the walls to isolate the walls to keep the cold out. Look on the local markets, in vintage shops to find some precious handmade pieces. A kids' room is the room in the house which will get a transformation every few years. Kids get bigger and have other interests. Handmade dolls, embroidered cushions, a branch of wood as a creative way to hang your photographs. A kids' room is the room where you can add color without the fear that it will be to much. It will enhance your kids' creativity. You are more the minimalist type but you can't resists the colorful accessories neither? They won't disturb your interior, they will only bring a sparkle of color. You probably shouldn't go for the very traditional pieces but you can take a look for some colorful objects made by young designers. Summer is a time where we want to have parties every weekend, to take out our colorful cloths and handbags. To mix all the plates we have on the table and make some easy dinners without standing to long in the kitchen. It is all about enjoying life. Preparing meals will be even more fun when your cooking utensils are colorful. Nice, colorful woven linens as table cloths, napkins, tea towels. A white modern space can be turned into a colorful room without changing to much the style of the house. Or you like to have everything around you as every object will remind you of beautiful moments, nice travel stories. Just a few items are enough to give a summery touch to your room. Strong colors, simple motifs, clean lines nothing complicated. White stays the perfect base for your bathroom, make a combination with blue and green tones and you will create a fresh summery look. Mexican hand painted washbasin or other objects will give the bathroom a joyful ethnic look all year round. To much for your bathroom? For sure it will not be to much for the powder room. Your guests will be surprised by your creativity. Add authentic by using faucets in old braze or copper. 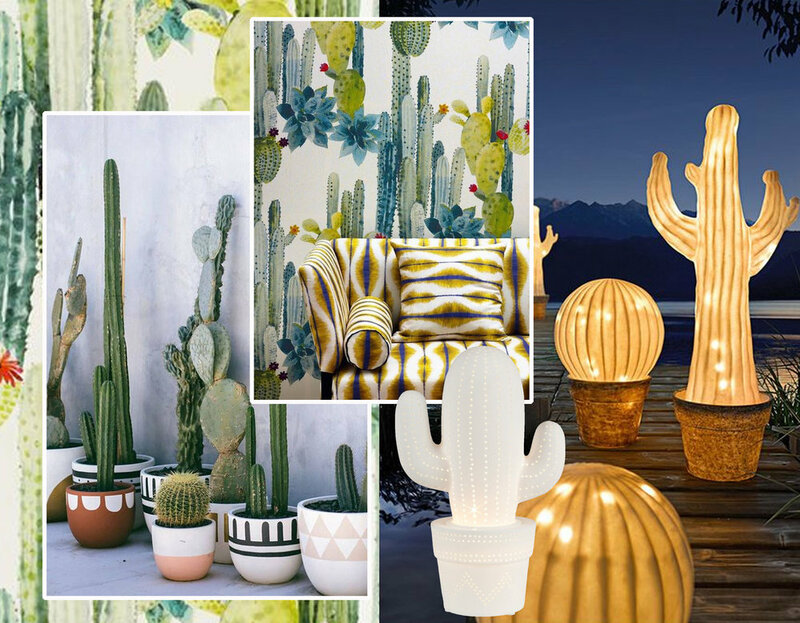 Cactus prints are trendy for wallpaper and fabrics. Combine them with some other graphical prints. Cactus is a plant which doesn't need to much care, so great option if you don't have the talent for gardening. They are very graphical and will fit every interior. You want them in your garden or on the balcony? Take care to take them inside in winter. Use some hand painted terra cotta flowerpots. Summer time is the time that we enjoy the outdoors till as late as much as possible. Think of some nice outdoor lamps and you will be able to enjoy your dinners with friends till late in the night. Get creative and bring the summer travel mood in your home.